The history of the Bible can be very confusing and is laden with various theories on who canonized what, and when, and for what religious order. For that reason, this page will not give a history about the canonization of the Bible. For the sake of simplicity, I will say the canons for what would become the King James Version of the Bible were complete well before 1604. In 1604 King James I of England authorized a new translation of the Bible into English. Prior to this, the penalty for those caught translating the Bible into English was death. The Bible that we now refer to as the King James Version was completed and published in 1611. The Bible consists of two sections or testaments. The Old Testament which consist of 39 books, and the New Testament which consist of 27 books. Here is a list of the books of the Bible. Each of the books of the Bible in both the Old and New Testaments is further broken down into chapters. Then each chapter is finally broken down into verses. When two people are discussing the Bible, they will often refer to a particular paragraph or sentence by its Book, Chapter and verse. For instance the first verse in the Bible would be referred to as Genesis 1:1, which means: The book of Genesis, Chapter 1 and verse 1. The Old Testament is also called the Tanakh (sometimes spelled Tanach, Tenak or Tenakh) and the Miqra or Masoretic Text. The Old Testament is grouped into three main groups. The first group includes the first five books of the Bible (Genesis, Exodus, Leviticus, Numbers and Deuteronomy) and is called the "Books of Moses", "Pentateuch" or the "Torah" which means "Teaching". However, in its widest sense, the name "Torah" can also be used in reference to the entire Old Testament. The Next grouping is called the "Nevi'im" or "Prophets" which is then broken down into three sections. The first of these sections is called the "Former Prophets" which includes the books Joshua, Judges, 1st and 2nd Samuel and 1st and 2nd Kings. The next section in the "Prophets" is called the "Later Prophets" and includes the books of Isaiah, Jeremiah and Ezekiel. The last section in the "Nevi'im" or "Prophets" is called the "Minor Prophets" or "The Twelve Prophets". This section includes the books of Hosea, Joel, Amos, Obadiah, Jonah, Micah, Nahum, Habakkuk, Zephaniah, Haggai, Zechariah and Malachi. The term "Minor Prophets" is in no way intended to suggest that these prophets were less important. It is simply in reference to the size of the books. The books of the "Minor Prophets" are much smaller than the books of the "Former Prophets" and "Later Prophets". Also the terms "former" and "later" should not be interpreted to mean these prophets lived before or after any of the others. In fact some of the books of the "Minor Prophets" are thought to have been written before some of the "Former" and "Later Prophets". The final grouping in the Tanakh is called the "Ketuvim" which means "Writings". This group consist of the books of 1st and 2nd Chronicles which are grouped to form one book called "Chronicles". Ezra and Nehemiah are grouped together to form one book called "Ezra-Nehemiah". Then, these 2 books (Chronicles and Ezra-Nehemiah) are grouped together with the book of Daniel to form a subdivision of the "Ketuvim" or "writings" called the "Other books". There are two other subdivisions of the "Ketuvim". One is called the "Three Poetic Books" which contains the books of Job, Psalms, and Proverbs. The other grouping is called the "Five Megillot" or "Five Scrolls" which contains the books of Ruth, Esther, Ecclesiastes, Song of Solomon and Lamentations. The New Testament is grouped into four sections. The first of which is called the "Gospels" or "Good News" and consist of the books of Mathew, Mark, Luke and John. These books are all about the life of Christ Jesus. They are also where the vast majority of "Red Letter Text" is found which denotes a direct quote of Christ Jesus. The second section is called the "Acts of the Apostles" and contains the book of Acts. The third section is called the "Epistles" or "Letters" and contains the books of Romans, 1 Corinthians, 2 Corinthians, Galatians, Ephesians, Philippians, Colossians, 1 Thessalonians, 2 Thessalonians, 1 Timothy, 2 Timothy, Titus, Philemon, Hebrews, James, 1 Peter, 2 Peter, 1 John, 2 John, 3 John and Jude. The final section is called the "Apocalypse" and contains the book of Revelation. The book of Revelation also contains a considerable amount of "Red Letter Text". The Bible is written much as an artist might paint a portrait. For example an artist might draw an outline or sketch first, then continue filling in the details as the painting progresses. The books of the bible are written in a similar manner. While reading the Bible, you will often notice that the outline of a story will be told and then the story will be either, repeated with more detail, or expounded upon. The first two chapters of the Bible are a perfect example of this early Hebrew style of writing. Genesis 1:1 through 2:3 tells the events of creation in chronological order. The remainder of Genesis chapter two then re-tells some of those events in greater detail. Comparatively, the Old Testament is a precursor to, and outlines the message of the New Testament. In essence the Old Testament contains the veiled message of the New Testament. Am I reading the Correct Bible? These days there is a "Bible" to fit every agenda. However, there is only one Bible that is the preserved word of God. There are ways to know which Bible that is. Learn more by visiting the Which Bible should I Read link. The Bible is life's instruction manual provided to us as a gift from God through 40+/- divinely inspired writers over a period of about 1500 years. 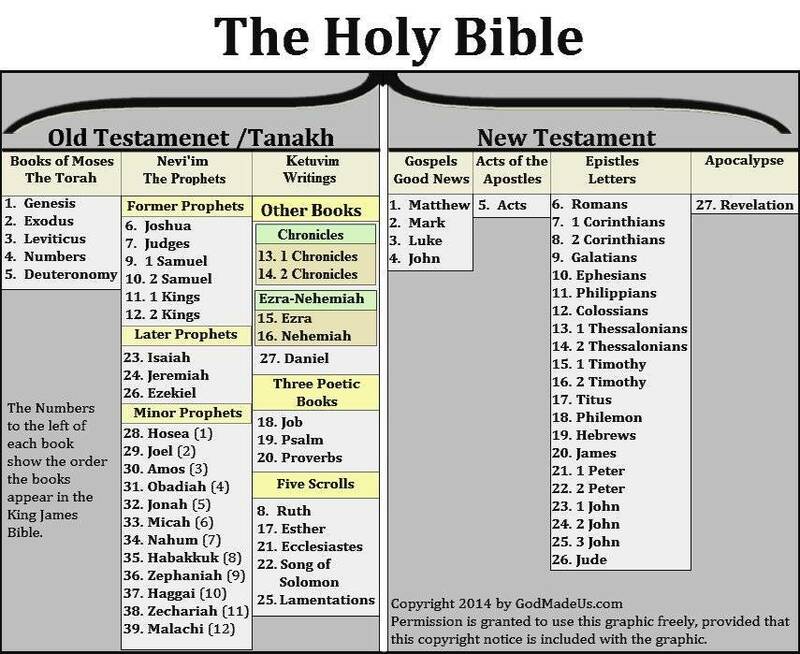 Here is a chart showing Who wrote the books of the Bible and when they wrote them. If you read the entire Bible, you will journey to the beginning of time and watch as the heavens and the earth are created. A heaven and Earth that is much different and better than what we recognize today. Your Journey will continue as you read about kings and common people, wars, plagues, famine and times of peace and plenty. The books of the Bible contain heroes and villains, love and hate, stories of unimaginable cruelty as well as unwavering loyalty and uncompromising love. The grand finale will describe the destruction of the heavens and the earth as well as the destruction or salvation of man on a new Earth beneath a new heaven reminiscent of the first. You will have traveled full circle and will have been exposed to the answer of every one of life's questions. Will you learn every lesson that life has to teach? Probably not, the first time you read it. The Bible is full of verses containing double yet consistent meanings. It is impossible to gain the full potential of lessons by reading the Bible once, twice, or even dozens of times. Every time we read it, we will gain new understanding and a new insight into its complex structure and the lessons within. The Bible is a book to be studied in depth. The more we study it, the more we will be convinced of its authenticity and divine inspiration. Read this guide if you are looking for evidence showing the Bible is inspired by God. No group of writers could have ever written such a consistent message over a period of 1500 years, without divine inspiration. However, many people still doubt the authenticity of the Bible. Those who study the Bible and make the lessons within its pages part of their life have no such doubts. If we heed the Bible, it will change our life for eternity. If you have doubts about whether or not you are being taught correctly, read this guide which will help you avoid many common pitfalls. The most important thing to keep in mind is to never let anyone discourage you from reading the Bible for yourself. The Bible is meant to be understood. We must ask God for the ability to understand it as we read it. God is faithful to provide the understanding that we need.